Until November 11th you can experience the magnificent work of the artist Gustav Klimt as you’ve never seen it before at a new digital art centre in Paris, the Atelier des Lumières. Marvel at this superb exhibition while enjoying your stay in Paris at the Hotel Les Deux Girafes. Discover Gustav Klimt's work and Viennese painting in a new way, via state-of-the-art multimedia equipment! Klimt and Vienna is the name of this exhibition in which the brilliant artist’s most beautiful paintings are projected onto the high walls of this former iron foundry turned art space. A spatial discrete sound system is used to complete the awe-inspiring immersive experience. You’ll be astonished at how the magic of multimedia is harnessed to bring you to a deeper understanding of the Austrian symbolist’s finest works. 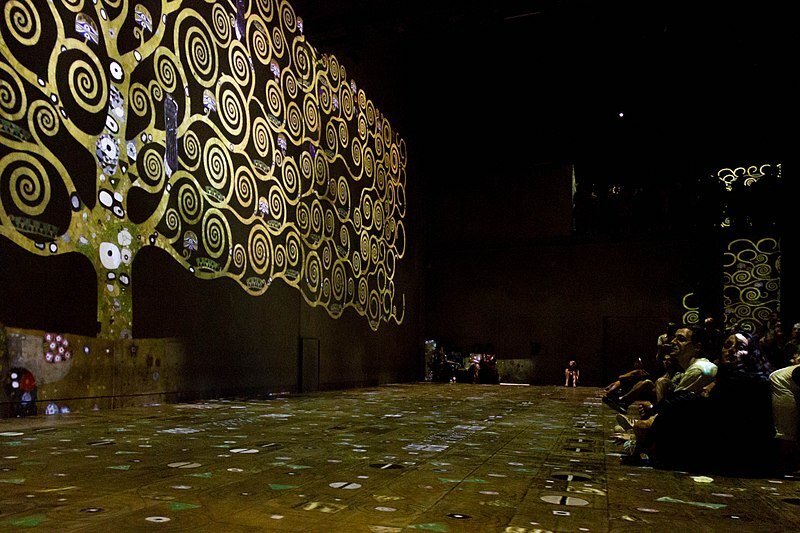 Located in the trendy 11th arrondissement, in a converted iron foundry, the Atelier des Lumières is the new cultural space that everyone in the capital is talking about. Following this inaugural exhibition in which the creative genius of Klimt is honoured, the Atelier des Lumières will continue to show multimedia art of all kinds. Keep an eye on its website! Welcome to the elegant, contemporary and bright atmosphere of this chic and charming establishment just a short stroll from the Atelier des Lumières. With its verdant patio, large terrace, delicious cocktails created by our bartender and an exceptional restaurant, the Hotel Les Deux Girafes will fulfil all your desires for comfort and well-being. Take a little time out from your daily life by relaxing at the Hotel Les Deux Girafes in Paris.